By Rukmalie Jayakody, Pennsylvania State University; Sheldon Danziger, University of Michigan; Kristin Seefeldt, University of Michigan; and Harold Pollack, University of Chicago. Originally published in Connection, a publication of AcademyHealth. Citing new estimates of the extent of substance abuse among welfare recipients, the authors suggest that policymakers and analysts have likely overstated the contribution of substance dependence to welfare receipt. The authors note that while substance use, abuse, and dependence are barriers to self-sufficiency, so are poor education, lack of transportation, physical and mental health problems, and other difficulties that are more common than substance dependence among welfare recipients. The authors stress the need for comprehensive services to address the multiple barriers faced by the most disadvantaged welfare recipients. Welfare reform, the 1996 Personal Responsibility and Work Opportunity Reconciliation Act (PRWORA), redefined the goals and daily operation of cash assistance. This law transformed the traditional entitlement to cash welfare under Aid to Families with Dependent Children (AFDC) into a transitional program, Temporary Assistance to Needy Families (TANF), which requires most recipients to work after two years of receiving assistance, or, at state option, even earlier, with few exceptions. After 60 months of receipt during a lifetime, a recipient is ineligible for federally-funded cash benefits. The welfare reform debate and its aftermath generated substantial discussion about the potential connection between substance abuse and welfare receipt, and about the role of substance abuse in recipients’ ability to leave welfare for work. This was a new development. The primary controversy in the welfare reform debates of the 1980s and early 1990s was the extent to which jobs were available for recipients as opposed to the extent to which recipients were “choosing welfare and rejecting available jobs.”1 The 1996 Act resolved this debate by requiring most recipients to work, although states have some discretion in making a limited number of exemptions from the work requirements. Several provisions of the 1996 law, and related measures, were targeted at those who use and sell illegal substances. Section 902 of the Act authorized states to use chemical testing to detect substance use among TANF applicants. About a dozen states have provisions allowing drug testing of welfare recipients under certain circumstances. Michigan is the only state that legislated suspicionless, population-based testing of recipients. However, Michigan’s policies have faced continued legal challenges. A federal appeals court halted testing in mid-2003 after an injunction stopped its implementation after only a month of operation. Our estimates using data from the National Household Survey of Drug Abuse (NHSDA) indicate that 9 percent of welfare recipients in 1994 and 1995 were alcohol dependent and that 21 percent had used an illegal drug in the past year (mostly marijuana). 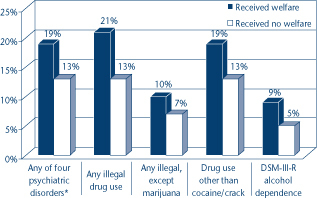 (Figure 1) Excluding marijuana, 10 percent of recipients had used some other illegal drug during the past year, with 6 percent having used cocaine or crack.7 Only a small minority of recipients (about 4 percent) satisfied the diagnostic screening criteria for illicit drug dependence (i.e., their drug use impairs their functioning in significant ways).8 Our analyses also document that psychiatric disorders, especially major depression and post-traumatic stress disorder, are more prevalent than drug and alcohol dependence among welfare recipients. About 19 percent of recipients had at least one of the four psychiatric disorders measured in the NHSDA. Welfare-to-work initiatives implemented by the states, together with an economic boom that generated the lowest unemployment rates in three decades, contributed to rapid caseload declines from the mid-1990s up to 2001, a decline that has slowed but has yet not stopped. Nonetheless, many women who received benefits when welfare was reformed were not able to find steady employment and leave the rolls in the aftermath of reform. As a result, some analysts speculate that substance abuse is now more common among the remaining recipients and that substance abuse poses a greater problem today than it did prior to reform. The logic of this argument is credible: as caseloads have fallen, women with the fewest problems have left the rolls more quickly. However, analyses using the NHSDA and the Women’s Employment Survey (WES), a panel survey of single-mother welfare recipients in an urban Michigan county, do not support these concerns.10 Although TANF recipients have become more disadvantaged along a number of characteristics related to health and mental health11, substance abuse and dependence is not a major contributor in defining the core group of recipients remaining on the rolls. NHSDA data in recent years indicate that the prevalence of illicit drug use among recipients has remained stable after welfare reform. Among WES respondents who received welfare in early 1997 and were still receiving benefits in late 2001, about 5 percent met the diagnostic screening criteria for drug dependence. In contrast, 22 percent met the diagnostic screening criteria for depression and 38 percent had physical limitations and self-reported “fair or poor” health. Private employers are allowed to test job applicant for drug use as a condition of employment. In the WES, about 36 percent of current and former welfare recipients reported that an employer had required them to take a drug test during the previous two years, but only 3 percent reported they had failed the drug test. While substance use, abuse, and dependence are barriers to self-sufficiency, so are poor education, lack of transportation, physical and mental health problems, and many other difficulties that are more common than substance abuse among welfare recipients. To date, most welfare-to-work programs have stressed acquisition of job search skills and rapid employment. Because many low-income mothers experience skills deficits and personal problems, including substance use disorders, more comprehensive programs are needed to move and sustain the most disadvantaged recipients on a path to self-sufficiency. 1Danziger, Sheldon. 2001. “Welfare Reform Policy from Nixon to Clinton,” in David Featherman and Maris Vinovskis, eds. Social Science and Policy Making, Ann Arbor, MI: University of Michigan Press, pp. 137-164. 2Swartz J, Lurigio A, Goldstein P. 2000. “ Severe mental illness and substance use disorders among former Supplemental Security Income beneficiaries for drug addiction and alcoholism.” Archives of General Psychiatry, 57(7), 701-7. 3Legal Action Center. 1995. State, local welfare officials see important role for drugs and alcohol treatment in welfare reform. Washington, D.C.: Legal Action Center. 4Califano, J. 2002. “To reform welfare, treat drug abuse.” Washington Post, September 18, p. A29. Pollack, H.A. & Reuter P. 2002. “Taking exception: Myths about drugs and welfare.” Washington Post, October 1, p. A21. 5Wilkins, A. 2003. “Substance abuse and TANF.” National Conference of State Legislatures, http://www.ncsl.org/statefed/welfare/substance.pdf. 6Olson, K., & L. Pavetti. 1996. Personal and family challenges to the successful transition from welfare to work. Final report. Prepared for the Office of the Assistant Secretary for Planning and Evaluation and for the Administration for Children and Families. May, 17, Washington, D.C.: U.S. Department of Health and Human Services. 7Jayakody, R., Danziger, S., & Pollack, H.A. 2000. Welfare reform, substance use, and mental health. Journal of Health Politics, Policy, and Law, 25(4), 623-650. 8Pollack, H.A., Danziger, S.A., Jayakody, R., & Seefeldt, K.S. 2002. Drug-testing welfare recipients: False negatives, false positives, unanticipated opportunities. Women’s Health Issues. 9Kaestner, R. 1998. Drug use and AFDC participation: Is there a connection? Journal of Policy Analysis and Management, 17(3): 493-520. 11Danziger, S.K., & Seefeldt, K. 2002. Barriers to employment and the ‘hard to serve’: Implications for services, sanctions, and time limits. Focus (newsletter for the Institute for Research on Poverty, University of Wisconsin-Madison) 22(1): 76-81; Lichter, D., & Jayakody, R. (2002. Welfare reform: How do we measure success? Annual Review of Sociology, 28: 117-141. 12Seefeldt, K.S. and S.M. Orzol. 2003. Watching the Clock Tick: TANF Accumulation in a Strong Economy. University of Michigan Program on Poverty and Social Welfare Policy working paper.